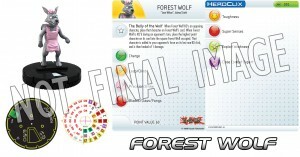 WizKids posted up some new Yu-Gi-Oh HeroClix previews with a look at the Forest Wolf, Little Red Riding Hood, and the Forest Hunter. And welcome back as we preview some more figures from the upcoming Yu-Gi-Oh! HeroClix: Series Two set.